The last time we went to Jamaica, we stayed in a beautiful all inclusive resort where they served really good food. I mean really really really good food. One evening I discovered that they also serve Tortuga Rum cakes! These are basically from Caribbean. The rum used to make is Tortuga Rum that is not for sale. 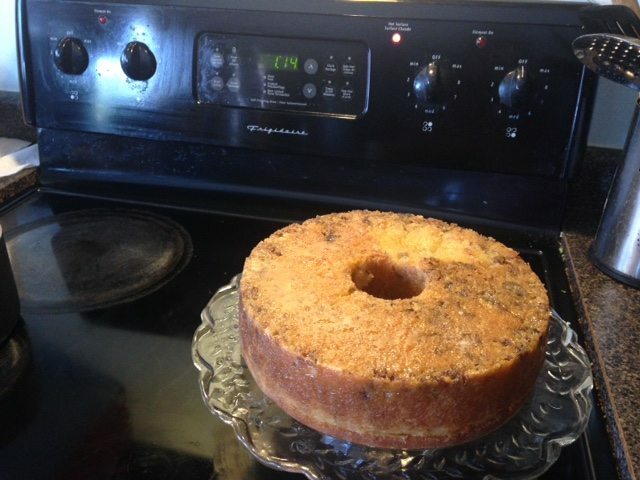 So, if you want a piece of Tortuga Rum cake, you really have no choice but to buy that cake! I had such a big slice of that cake that soon I was sporting a happy buzz, walking around the resort. After coming home, I tried making the cake using Captain Morgan dark rum. The taste was "almost" close to the actual cake. Here is the recipe; as you can guess, I didnt make this up. I followed the recipe online. 1. After one hour of baking, I tested to see if its completely baked. I needed to put that back in the oven for another 6 minutes before the insert came out clean. 2. I used Captain Morgan rum but any dark rum should be ok.
3. I was also told that if we soak the walnuts in rum overnight, it adds flavor but i never tried it. 325F Thats a lower than normal temperature setting for a cake, some thing you arrived at by experience or is a recommended setting. 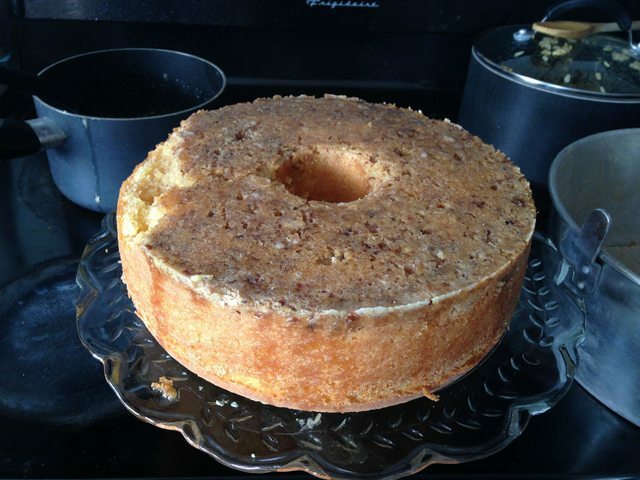 Not a fan of rum cakes, so will not be making this. btw, whats a bundt pan? Ya, my oven's default setting is also 350. I also read it twice to make sure it indeed calls for 325. It's the recommended setting. Bundt pan is the one that's a wide bottom deep dish with a little tube coming out in middle to distribute the heat evenly. You will be able to find these in the same isle where you find muffin/cake pans. Here is today's cake! just finished glazing it. I hope it holds together until this evening. Once during Christmas it broke into half. The center part of the cake gets done last, kind of ruptures and sometimes causes the rest of the cake to burn a bit. I always thought this bundt pan was to enable cutting slices evenly. Never correlated the two for heat dissipation, guess this was never mentioned as an application in all the Thermodynamics classes I took. Ooh! Thermodynamics! I don't know all that, I always assumed that for deep dish, wide bottom baking you need to distribute the heat evenly; else you will find raw spots and hence the bundt. I think you can also use some butterfly hooks (I forgot the actual name) to distribute the heat. And you didn't comment on how the cake looks yet! Cake looks good, I mean very even and prolly with the dusting came out easily from the pan. Your father and family will enjoy. The only cake we bake at home is an apple carrot eggless cake, comes out great, used for evening snack with tea or coffee. How about simple vanilla cake made by your sister? Lick the batter bowl clean? Yeah thats a classic, but I hardly ever have a craving for a cake. Ice cream is all the sweet I have other than kheer or basundi that once.